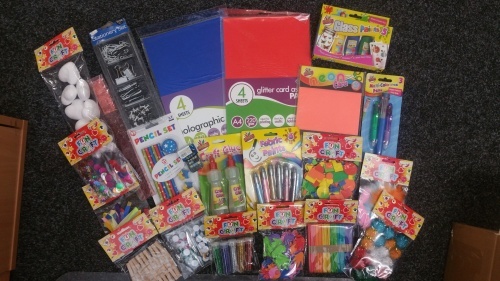 We have just A COUPLE of this specific combination so if it's not what you are after, please see our other items as we have a variety of kids craft/colouring items/boxes up for sale - all limited stock, when they are gone, they are gone. Sorry but this is sold as seen and we will not substitute or swap items. Not suitable for under 3's. Probably ideal age range for this item is 5-10 years (bear in mind drawing pins) or older but please decide if you think products are suitable for the child before ordering. Ideal to split up for various gifts, stocking fillers or pass the parcel.